Podcast royalty admits new members to the kingdom. Slate has unleashed the power of its podcasts with the debut of Panoply. 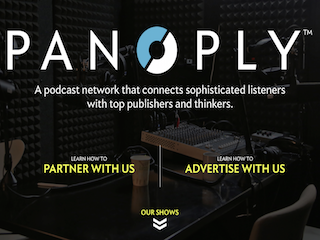 Panoply is a semi-open podcasting platform that will allow other companies to access Slate’s podcast resources, including sales, production, and audience development and distribution. We say “semi-open” because as Mashable reports, only Slate approved companies will be able to use Panoply. As of now, Huff Post, Real Simple, Inc., The New York Times Magazine, Popular Science and New York are using the platform. Panoply isn’t restricted to companies and magazines. Individuals such as Baratunde Thurston are using it for his podcast on race. This is a smart move by Slate. The site has a rep for producing great podcasts, so it makes sense to try and leverage that power.